The chuck, or beef shoulder, contains a large number of mostly small muscles running in several different directions. Appropriately, they're known by a similar variety of names in different parts of the country. For example, two different roasts are sold as inside-blade, depending on your butcher's preferences. One is the bottom chuck, also known as a California roast or under-blade roast. The other is the chuck eye, sometimes called a boneless chuck roll. Both versions of inside-blade roast make good pot roast and are cooked the same way in your oven or slow cooker. Trim most of the surface fat from your roast, leaving only 1/8 inch to hold the meat together after it's cooked. Skip this step if your roast is rolled and tied. Sear the roast in a heavy skillet or Dutch oven until it's well browned on all sides. Season the meat with salt and pepper, then set it aside on a clean plate. Add coarsely chopped onions, carrots and celery to the pan and stir them for 5 to 7 minutes, until they're beginning to brown. Lift out the vegetables with a slotted spoon and transfer them to a bowl. Pour off any excess fat from the pan and return it to the heat. Deglaze the pan by pouring in 1/2 cup of broth, water or red wine, then stirring the pan vigorously to dissolve all the browned-on juices from searing the meat. The stuck-on juices contain lots of concentrated savory beef flavor and add greatly to the finished dish. Remove your Dutch oven from the heat after deglazing it and return the browned vegetables to the pan. Arrange them to make a pad for the beef, then place the pot roast on top of the vegetables. Add enough extra cooking liquid, such as broth, water or wine, to immerse the bottom 1/3 to 1/2 of the roast. Add any flavoring ingredients you wish, such as bay leaves, peppercorns or garlic cloves. Cover the Dutch oven with its lid and slide it into the middle of an oven preheated to 325 degrees Fahrenheit. Simmer the pot roast for 3 to 4 hours, turning it once or twice, until the beef is tender enough to easily insert a fork and twist away a tender morsel. Remove the pot roast from the Dutch oven and transfer it to a serving platter. Let it rest under a loose covering of foil while you prepare the sauce. Strain the cooking juices into a heatproof container, such as a tall, narrow measuring cup, and skim off the fat that rises to the surface. Pour the juices into a saucepan and simmer them until they're thick enough to use as a sauce. 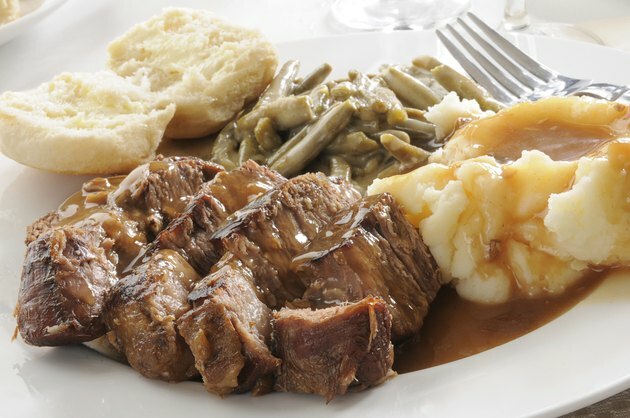 Serve the sauce with your pot roast and its side dishes. Arrange the browned vegetables in the bottom of your slow cooker to make a cushion for the roast. Place the beef on top of them and pour in the juices from the Dutch oven or skillet. Pour in enough additional broth or wine to come halfway up the sides of the pot roast. Add flavorings such as bay leaf or garlic as desired. Replace the lid on your slow cooker and plug it in. Simmer the pot roast for 3 to 4 hours on the "High" setting or 6 to 8 hours on the "Low" setting, whichever best suits your schedule for the day. The beef is done when it's meltingly tender and you can easily pull off a mouthful with your fork. Remove the beef carefully to a serving tray. It might fall apart under its own weight, so it's helpful to hold the tray right next to the slow cooker. Strain the cooking liquids from the slow cooker and skim any excess fat from the surface. Simmer the braising liquid in a saucepan until it's thick enough to coat the back of a spoon. Taste it and adjust the seasoning if necessary, then serve the sauce with your pot roast and choice of side dishes. If you want to cook potatoes or vegetables alongside the roast, add them during the last hour of cooking. Pot roast is edible once it reaches the well-done stage, but it isn't finished at that stage. The meat must linger at an internal temperature just under the boiling point until its tough connective tissues dissolve into gelatin. This is what gives pot roast its characteristically lush and tender texture.